I’m back on my food journey. It’s a long one with no end in sight. Will I ever find a diet I can feel comfortable with? One that is healthy, nutritious, keeps me at the right weight and doesn’t cause disease? You may remember my vegan tendencies after reading The China Study. As promised, I have now finished The Omnivore’s Dilemma. I really enjoyed reading this book. Not only because it opened my eyes to the scary way in which we now process the bulk of our meat in America, but also to make me realize that all meat is not created equal. The diet and life style of the animal can have a huge impact on the nutritional value, not to mention the environmental damage. So, given my impressionable ways, I’m now on a quest to find local farm fresh, REAL free range eggs and chickens as well as grass fed beef. Luckily we live in Illinois, so these things are not hard to find close by. After a bit of research, I found a bunch of farms that will sell to individuals. One thing I am finding difficult to get used to is seasonality. Also if you want to buy direct from a farm, it’s very different from a supermarket. You want chickens? Buy them anytime except for winter. Beef? You can only buy them in the fall, most places need you to pre-order and need to buy somewhere between 1/4 and 1/2 of a cow and find somewhere to store it for the year. Eggs are available any time, but I’m not sure I want to drive 45 minutes to get them. My poor husband. One day he’s got to put up with my vegan cooking, the next day I’m asking if we can buy 1/4 of a cow and store it! As most things in my life, once you start to become aware of an idea or thought it seems like the answer will come to you in a way you never anticipated. So, while I was at a play date at my friend Carrie’s the other day, telling her about the book I’d just read and my quest for grass fed, real farm raised meats and eggs, her nanny piped in about a place she uses. This afternoon we were invited to an ice skating party at Bicentennial Plaza. 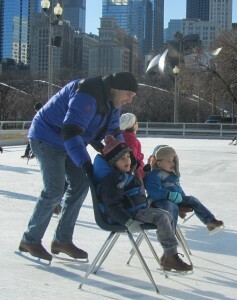 It was the first time our kids had experienced ice skating. Okay, the kids didn’t end up doing a lot of ice skating. Adam was the only one who got a real work out. Mostly they sat on the chairs and danced to the music while Adam pushed and spun them around. But hey, it’s a start! It was one of those occasions I really wished I wasn’t pregnant. Normally that feeling only happens when everyone else around me is drinking, so it was a surprise. It just looked like so much fun! I can’t wait to go back when I’m able to skate. The party we went to was a private rental from 1-3:30 but they are open Monday-Friday, 1-9 p.m and Saturday and Sunday, 3:30-8:30 p.m. There is a teen skate every Friday, 5-7 p.m. It’s $7 for skate rental and admission is free. I’d try to get there by public transportation. We couldn’t find street parking and ended up parking in the Millennium Park garage for 3 hours and were charged a whopping $30 dollars. I’ve been meaning to try this place for a long time. I definitely wanted to try it while I was still pregnant and my philosophy was – calories don’t count. I’ve seen reviews on it which intrigued me, but nothing made me want to try it more than the daily line outside the door. 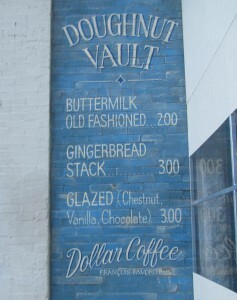 Amazing, considering The Doughnut Vault only has three kinds of doughnuts and one kind of coffee! I tried buying once on a Sunday, they weren’t open. Then tried them on MLK day and again, not open on Mondays. In fact, I’ve never seen a company make less efficient use of their space! They basically just sell a few items until they are sold out. I arrived at 9:15 and the guy in front of me was hoping they still had all the varieties. They opened at 8:30! I guess it’s one of those new era type of business plans. Hip Hop blares in the back ground as you step to the counter to place your order. They twitter prolifically. The website is a blog. They are an elusive sort of cult – open for a short time and not every day. The product is not abundant. They make special doughnuts on certain days to keep the regulars interested. This week they made Pistachio, Lemon Poppyseed, and Double Chocolate Yellow Cake. A guide to the menu above: The old fashion buttermilk are a normal size doughnut, kind of like a cruller. The gingerbread stack are actually three doughnuts per order. The glazed doughnuts are the size of your head. But don’t let that deter you. You’ll eat every last bit of it. And the review on the doughnuts? Amazing. Sugary and tasty on the outside with fluffy, dough on the inside. I highly suggest trying them once but unless you want to die young of a heart attack, don’t make it a regular breakfast choice. I can’t believe how quickly this pregnancy is happening. Already I’m starting to get upset that it’s all going to be over too soon. Unlike any other pregnancy, I KNOW FOR SURE that this will be my last pregnancy. Like a told a friend of mine the other day, I kind of like being pregnant. (Although I do remember thinking “I will never get pregnant again” a short two months ago). Eating whatever I want is so much fun. Unlike normal times I don’t push myself to get things done and I don’t feel guilty at all. And I love how woman, complete strangers, will talk to you intimately about their kids, pregnancy and twin stories. It makes me feel like we are all part of a secret club together. They will tell me how difficult and hard it was, but the smile on their face betrays something else. It says – it was the best time of my life as well. Birth is sloppy, risky, and exhausting but it’s exhilarating as well. I love the feeling of anticipation, the part where we are now. How will this science experiment, this mixing of our genes turn out this time? Adam’s newly merged law firm comes with some new perks. Like a sky box at Gillette Stadium. So Sunday he flew out to see the Championship game against the Baltimore Ravens. 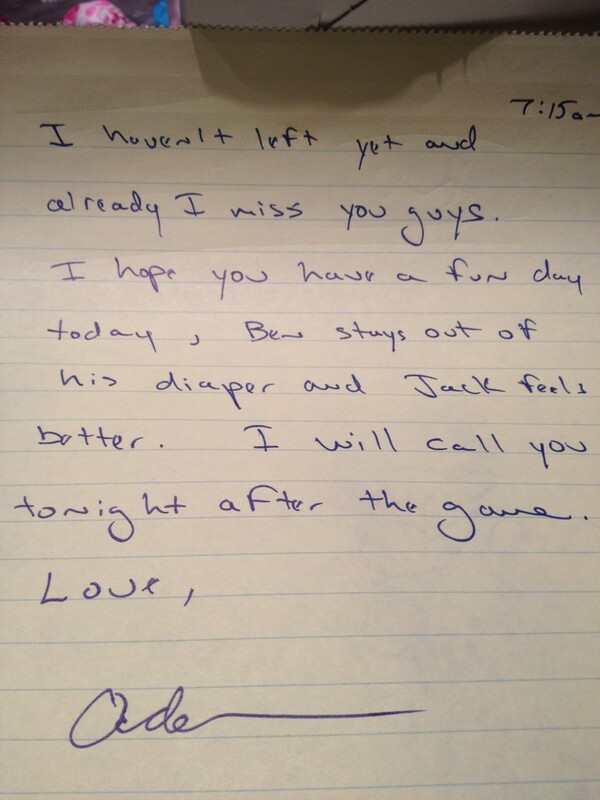 Before he left, he left me this note, which I think due to my pregnancy hormones made me all teary…. It’s stuff like this that makes me think I married well above myself. Above you see his reaction to going to the game. My reaction when I heard? It’s funny how we change as mothers as time goes on. 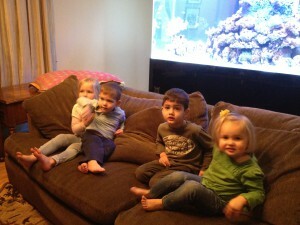 When we had play dates with our first born children, we would all sit around in one room, watching the kids interact closely. We would reprimand them for any little misbehavior, all while comparing every detail of their lives, from the hardships of getting them to eat a balanced diet to the color of their poop. Such were my thoughts when I opened the bathroom door at my friend Lottie’s house this afternoon to find my second born son in the bathroom with her third born daughter. Both kids had their diapers and pants off. Ben was sitting on the mini-potty and Georgie was standing behind him complaining it was her turn. I have no idea how these two little 2 and 1/2 year olds who are not even potty trained yet decided collectively they should go into the bathroom, close the door, take their pants off and pee together. Now that we all have more kids, Lottie and I were busy in the kitchen preparing dinner and talking about things that have nothing to do with diet or poop. Still I was upset that I didn’t have a camera ready to record this odd moment which struck me in the funny bone. I actually think since it was Lottie’s third, it wasn’t even that funny for her. Just par for the course. Xin Nian Kuai Le to all my China friends, and Kung Hei Fat Choi to all my Honkies! Today we crashed my friend Pam’s family day out at the Garfield Conservatory. They were having a Chinese New Year celebration. 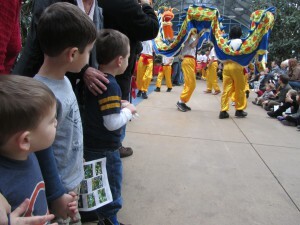 Special scavenger hunt, dragon parade, fortune cookies, clementines and apple cider. It’s a wonderful place to visit in the winter. Some of the rooms are so warm and moist. It can be quite a relief, especially if you are suffering from sinus problems. Most days they have events or activities in their children’s garden. Today the kids enjoyed the slide and digging in the dirt for bugs before heading to the see the dragon. I’ve been here a few times and it’s never too crowded. And because it’s not smack in the middle of the city, parking is free. No entrance fee either! After Ben’s first round of antibiotics (Amoxicillin), he was doing much better. No more chesty cough. He was back to his usual giggly self. However, the rash which first tipped us off to Strep persisted. We had given him Amoxicillin in the past and it didn’t work, but it was to clear a bacterial infection. We were told by the doctor’s office that for Strep, Amoxicillin was quite effective. So, last weekend Adam asked me to bring Ben back to get another Strep test. They looked in all the cavities in his head and they looked fine. Then she looked at the rash. She said it wasn’t the normal look of a Strep rash. However, his bumpy, goose pimple-like skin was. She gave him the test again. I was surprised, so was she. She said she almost never sees it after a dose of Amoxicillin, but perhaps he caught it again or maybe he’s a carrier. At this point we looked at Ben. He was laying on his stomach licking the floor of the doctor’s office. We are now finished with another round of antibiotic (Azithromycin). At first it didn’t clear the rash, but we were also given a topical steroid cream (Hyrdrocortisone) and it seemed to work. I’m not even sure the two were related (the rash and Strep) but I’m just glad that we live in an age where these things are easily rectified. Finally Ben is sleeping well again at night. I’m not getting woken up until somewhere between 4 and 6am. Given the past month, it’s considered a windfall. Of course, as soon as that situation was solved, another one surfaced. Last night just as Adam and I were going to bed, Jack woke up and threw up all over his bed. Nothing like having a sensitive nose from pregnancy and be bombarded with the stench of puke. Unfortunately it didn’t stop. I sat upright on the couch while Jack slept on me, waking up every hour or two to puke. (Jack felt better in the upright position.) Adam got up and cleaned the various puke filled blankets each time. At 4am Adam and I switched. Just in time for Ben to wake me up, but I settled him until 7am. Adam didn’t get so lucky and was basically up all night. Seems like everything in this pregnancy is exaggerated. Everything is bigger, sweatier, more emotional, and more exhausting. 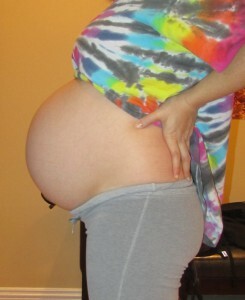 I’m still waiting for my 2nd trimester where I’m not tired anymore! Shouldn’t it be here by now? I guess some other signs I’m in my second trimester have surfaced, like I’ve been slowly cleaning and organizing every bit of our house. Nesting, they call it. Perhaps the reason I’m still tired well into the 2nd trimester is because I’m so huge that just carrying myself around all day leaves me worn out by 7pm. Lately even walking up the stairs too fast can cause me to want to throw up from over exertion. If that little amount of effort can effect me, it means that most things I love to do at the gym are now off limits. Lifting weights, my favorite yoga class which leaves me feeling like I’ve been wrung out like a wet rag, or the elliptical (45 minutes of sweat and TV watching combined – a multi-tasker’s dream). 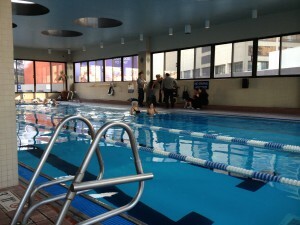 So, I’ve started a weekly morning water workout class at my gym. I’m the youngest person there by at least 25 years, but I’m panting away like the rest of them. Every time I go to this class I think, I can’t wait to be old so I can take this class without looking like a freak! It’s just one of the many reasons why my husband always says I would make an excellent old person. Water workouts, my want for a huge Cadillac and my closet obsession with country music will all fit together nicely at that point.